Being a coffee addict has its highs and lows – from discovering a cosy artisan coffee house that has beans from countries you’ve never even heard of, to that watery cup of instant that you reluctantly sup at 4pm to give you that vital little caffeine boost to get to the end of the day. The most important time of the day for the coffee lover is the morning – and that first cup of coffee you have at home should be the best. Start the day with a perfect coffee moment, and what can go wrong? Over the past few years, new ways to make coffee have popped up in posh coffee establishments, travelling from America and our coffee loving European neighbours. Now many of them are available to try at home. If you want perfect coffee at home, there’s now lots of different ways to make it. Invest in one of these amazing ways to get coffee and fall in love with the taste all over again. You deserve better than instant! Take a look at some of these methods of making coffee at home and go to bed dreaming of your perfect morning coffee! 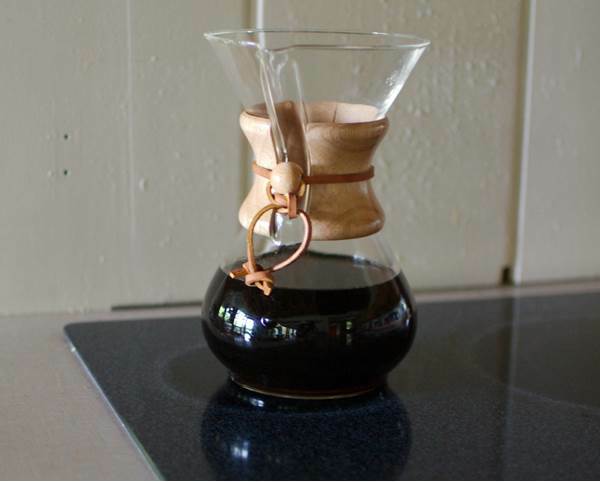 A popular choice at high end coffee shops, chemex coffee makers look like they belong in a lab rather than a kitchen – a conical flask with a filter set up for a purifying drip process. This scientific method takes a little effort to set up – but it’s worth it. The filter takes some of the bitterness out of your cup, making it perfectly smooth and ground-free. They’re the perfect gift for the coffee snob in your life. Another piece of lab equipment for coffee nerds, the Aeropress was invented in 2005 and has quickly been praised as one of the top ways to get the best out of your bean. Looking like a giant syringe, the Aeropress promises coffee as strong as espresso and with a low acidity level. You might want to buy a pair of goggles to go with the look! Available in various brands, these “pod” coffee makers are huge in Europe (and with George Clooney), and are ideal for homes where everyone likes a very different (and very specific!) kind of coffee. The pods contain everything you need for various strengths and styles of coffee, and just need to be placed in the machine and it does all the work. Leading brands claim to work out at around 19p a cup, not bad for coffee that can’t go wrong! With all these new fancy gadgets around, sometimes the best option is to go old school. If you’re new to the world of good coffee, the cafetiere, or French press, is the perfect place to start. Remember to use fresh water (don’t be tempted to use the water left in the kettle overnight – this won’t make a good cuppa), leave to brew for a few minutes, press and serve – sometimes it’s the simple solutions that work best!